In September 1974 Fairchild Camera and Instrument’s Fairchild Semiconductor division announced they were throwing their hat into the microcontroller market. The same Fairchild whom created ‘Silicon Valley’ whom many of the ‘greats’ of the industry originally worked, including Gordon Moore, and Robert Noyce, of Intel fame. 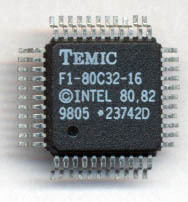 In April 1975 Fairchild began sampling the F8 processor with production quantities available in the fall of 1975. Fairchild knew the importance of having second sources available and in June 1975 reached an agreement with Mostek to allow Mostek to produce the F8 as well. The 10 year agreement with Mostek included complete mask set transfers as Mosteks NMOS isoplanar process was completely compatible with Fairchilds. The agreement also called for continuing development of the F8 processor system, allowing each company to develop F8 products independently of each other as well as together (this is important down the road). Mostek was able to rapidly produce the F8 system, faster, cheaper, and more reliable than Fairchild. The F8 introduction price was $130 per unit. When Mostek began production in 1975 prices were down to $85 per unit. In February 1976 Mostek lowered prices to $55 per unit ($64 to $28 if you bought more than 100 pieces). The F8 was also licensed to SGS-Ates of Italy in 1976. Also in February of 1976 Fairchild signed a agreement with Olympia Werke A.G., a German company, allowing production and sharing of information on the F8 processor. It also allowed Fairchild (and any of its second sources, including Mostek) to use any of Olympia’s processor technology and products. So why did Fairchild reach such an agreement with Olympia, a relatively small company? Because General Instruments was suing Fairchild at the time. It gets a little messy here but try to follow along. A man named Dr David Chung (head of GI’s microprocessor division) was dispatched to Olympia to pick up some proprietary information on a top secret 8-bit processor Olympia was developing called the C3PF. 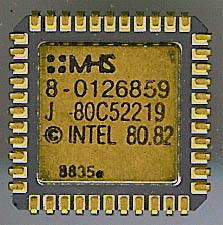 GI had an agreement to license this processor technology from Olympia and it was Chung’s job to get the information to make that possible. Very shortly after Chung’s return from Germany he quit GI. Who hired him? Fairchild of course. GI accused Fairchild (and Chung) of using the proprietary information on the C3PF to develop the F8 processor. By reaching an agreement with Olympia, Fairchild now was legally covered if in fact they HAD used information on the C3PF in the design of the F8. Unfortunately very little information exists on the C3PF but it is widely believed that it was the basis of the Fairchild F8. The court case went on into the 1980’s by which time it didn’t really matter. I was unable to determine who ‘won’ but by production dates of the F8, it didn’t matter one way or another. So what about the processor?